The Serpent was wily enough to misinterpret the one law that was set down for the first pioneer settlers of this planet Earth besides telling the First Couple to be fruitful and multiply. So too do misinterpretations of RULE OF LAW abound on our campus that was formerly a Communist party school which happened to be anti-family, anti-freedom and anti-truth. The serpent still prowls around our campus that is supposedly the Tree of Knowledge in the City of Apples and the rest of Kazakhstan. I believe the serpent doesn’t want anyone to know how to cite other people’s research correctly [better known as plagiarism] and also the serpent is VERY into Vanity Press publications and publishing “scholarly articles” on the Internet. Unfortunately for him and others of his ilk, there is good reason to have one’s writings peer-reviewed and not put on the Web that might be here today and gone tomorrow. The serpent will ultimately be stamped out and crushed under the foot of Truth. Perhaps there is good reason for the Kazakhs, in the City of Apples, and in the rest of Kazakhstan to be skeptical of change, especially rapid change according to Mukhamet Shayakhmetov, the author of “The Silent Steppe: A Story of a Kazakh Nomad under Stalin.” He wrote that his people need to keep up with the changing times when he laments on p. 147 The way we Kazakhs have always clung to the past has proved disastrous for our people – and yet this stubborn habit still sometimes obtains [remains] at the start of the twenty-first century. To say that the fear of innovation hampers our development and leaves us lagging behind is an understatement. However, Shayakhmetov knew only too well the ills of communism that tore his own family apart during the collectivization period of seventy years ago. On page 170 he wrote: Apart from consistently not having enough to eat, what drove my uncle to despair was the way Communism had undermined the foundations of family life. Unfortunately, there is something more insidious lurking around the “hallowed” halls of our institution of higher learning in the City of Apples. One particular serpent who is known for sexual harassment is also known for his e-mail harassment by restructuring and misinterpreting the understood “givens” where RULE OF LAW presides in real democracies. Apparently there are too many “Alpha males” (who are really omega males) without their wives or families (if they have any?) residing at our university, need I say more? No, Eve is not to be blamed for the ultimate fall of man, the serpent is. Sexual harassment started at the beginning when the serpent beguiled Eve with his cunning questions about God’s ultimate authority in the Garden. Some of you dear readers may dismiss the Genesis story but those of you trying to do your job of teaching and researching for the benefit of the glorious nation of Kazakhstan in the City of Apples know of what I write. Reading through the first message, with the help of a friend who has a law degree, I found that the author of the e-mail was making fallacious claims about certain laws concerning the misuse or abuse of our use of electronic research databases. This person was using a bullying tactic by interpreting the law which had nothing to do with my pedagogy whatsoever. I have the backing of several in our academic community who understand the use of electronic databases the same way I do. Unfortunately, there are those who are suspicious of the Information or Computer Literacy that has taken over in the West. No more can you apply for different grants or answer the distant “call for papers” without doing it electronically. Gone are the days of mailing in your application through the regular postal service, our globalized world is getting smaller thanks to the Internet. So, where is our leadership in protecting foreign faculty who come to the land of apples and apostils? According to Kazakhstan’s President N.A. Nazarbayev in reference to our university, “Everything here is done to the highest standards, there’s no need to go abroad to study.” Therefore, we as foreign faculty are making it more affordable to have Kazakhstani students study at our institution rather than have them go abroad to the West and find out that the standard in writing and computer literacy are far higher than earlier suspected. What would Solzhenitszyn say NOW about Kazakhstan if he were to ever return to this land? What would he write about our university which requires “apostiled” documentation of their foreign faculty? Just curious. p. 106 “The people of Kalmakbai strictly observed their time-honoured traditions, and treated us newcomers with great kindness and consideration. It was here that I first heard people cite the popular saying, “Your duty to your neighbor is as sacred as it is to God.” And I think I understood what it meant when I saw how attentive our neighbors were to us. p. 154 I have tried to contribute by at least reminding my children (who have always lived in towns) of the duty families have towards needy relations. Every living creature has to take care not only of itself, but also of its descendants who will ensure the survival of the species. And as a popular Kazakh saying puts it, “There is no life without movement”; constant activity is required to sustain it. p. 32 “In 1930, the main topic of conversation was the daily news brought to the steppe by word of mouth (the so-called uzyn kulak – ‘long ear’ of the steppe telegraph), which was our only source of information. Because we did not have radios or telephones, or even a postal service, it could take up to a year for information about new laws or important events to reach the far-flung regions of the country. p. 52 “Where the front wheel goes, the back wheel has to follow…” Now I know what that saying means. He was referring to his elder brother Toimbai’s dispossession as a kulak in a similar way the year before. Inspiration for my screenname “Kazakhnomad” of my blog was taken from this book by Mukhamet Shayakhmetov. I use this name with great respect and admiration for him and his family and all the other Kazakhs who enjoyed a nomadic way of life before communism changed it. Shayakhmetov is the real “Kazakh Nomad” who witnessed firsthand Stalin’s reign of terror. I will be forever changed by one Ukrainian student’s essay eight years ago which opened my eyes to the suffering that his nation endured under Stalin’s iron fist. 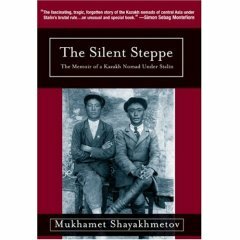 The truths in this book “The Silent Steppe” concerning Kazakhstan ring true that many in the West do NOT know the evils that happened in the former Soviet Union. Thankfully with a little more information from my Russian Kazakhstani friend, I was able to find a poem attributed to the conundrum our Central Asian university faces. We have separate ethnic groups in places of authority who are trying to pull the same load in vastly different directions. Ivan Krylov was on to something about how our institution of “higher learning” will get itself out of its mess. Or will it? How DID Krylov know? The Pike made for the river nearby. They could not agree on an approach out of the mess. 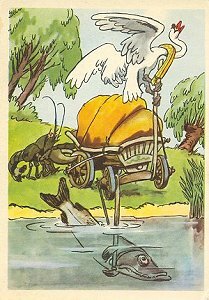 Yesterday one of my Russian teaching friends told me of a folktale which typifies what is going on in the leadership of our institution of “higher learning.” Let me know, if you know this famous Russian story about a bird, land animal and fish. All three had a mission together but couldn’t accomplish it because their environments were at odds with each another, seems true with the many cultures involved at our university. Simple Google searches have not yielded the information I’m looking for, so I’ll go back to my friend today to get more specifics. In the meantime, here is what I found out from this Russian Folktales link. I am using some of the material from this website but sorry that I can’t give proper attribution to the author. Maybe if the author of this link tracks his visitors, he will be able to tell me what folktale I am looking for. The goat is cunning, and female (Russian — “koza,” a feminine noun). The rooster is cocky and boastful, and male (Russian — “petukh,” a masculine noun). The animals in the tales behave in many ways as real animals do: carnivorous animals eat meat, even when the “meat” in question can talk. Wild animals are dangerous, and that they can interact with people does not mean that they are tame or “civilized.” A bear or a wolf may attack or even eat (or attempt to eat) a person. There is usually no reason for the animal characters to behave as they do, other than their nature. Of course, personal gain is a clear motivation for their actions, but not for the form these actions take. The wolf is bad because he is the bad wolf, not because he had a difficult childhood; the hare is cowardly because it is a hare, not because of some trauma. Animals, like other folk-tale characters, behave accordingly to their roles.